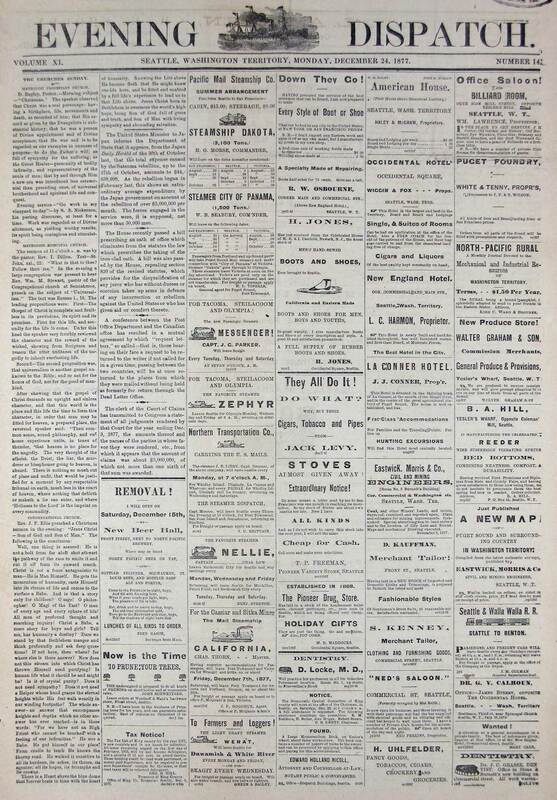 For the occasion of this Christmas 2009 Ron Edge has pulled out the full four pages of Seattle’s Evening Dispatch for the Monday Evening of Dec. 24, 1877. For those with the steady temperament to insert themselves into a small community of well under 4000 citizens – and yet still with five churches and many more bars – a close reading of these pages will take them away. We will include now all four pages of this Dec. 24, 1877 issue, and separate them by short notices of some of what we found on each page. The reader may, of course, skip our comments and go directly to Brown’s Dispatch. First – the first page. Also on page one and nearly directly to the right side of Dillon’s sober description of mankind is Fred Gasch’s announcement that he will open his “New Beer Hall” on Front Street (First Avenue) next to the North Pacific Brewery, and so also near the waterfront foot of Columbia Street. And for joyful encouragement Gasch includes in his advertisement his own sermon, of sorts, a rhyming one in song. It goes . . .
Come to the Fountain to-night, boys, / And fill with foaming beer. / What if your heads get light, boys, / The pleasure of life is here. / Eat, drink and be merry today, boys, / The old-time philosopher said, / Then go to the Fountain and stay, boys, / Till the shadows of the night have fled. One more mention for Page one. The Seattle and Walla Walla Railroad is listed with a charming little graphic for the train, and a schedule for its Seattle-to-Renton runs. Of course, not once did it make it as far as Walla Walla. 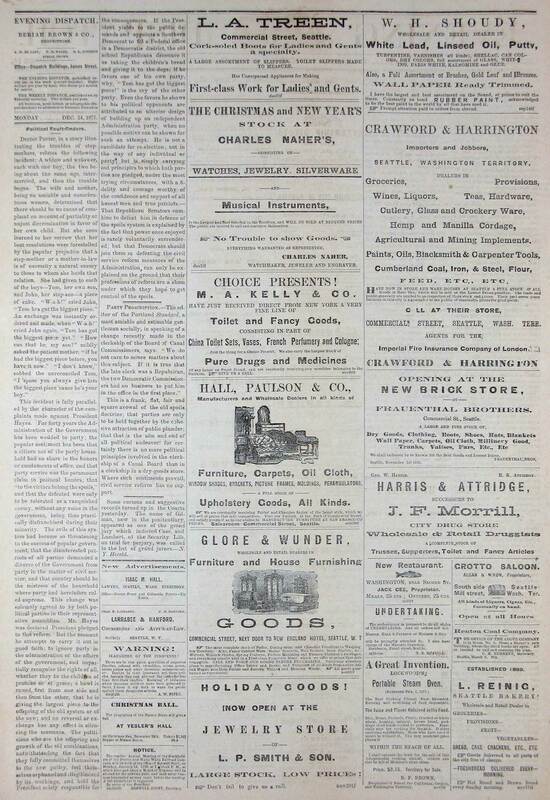 So much of page three is simply a “good read.” This begins with the far left column under the heading “The City, A Merry Christmas” and its spirited report on what to expect with Christmas, 1877. The page includes a number of shorter reports including one about a tunnel being built below Washington Street near Third Avenue in order to re-route spring water from First Hill directly to the tideflats rather than to the basements of the the homes and establishments in that often sodden part of town south of Mill Street (Yesler Way). 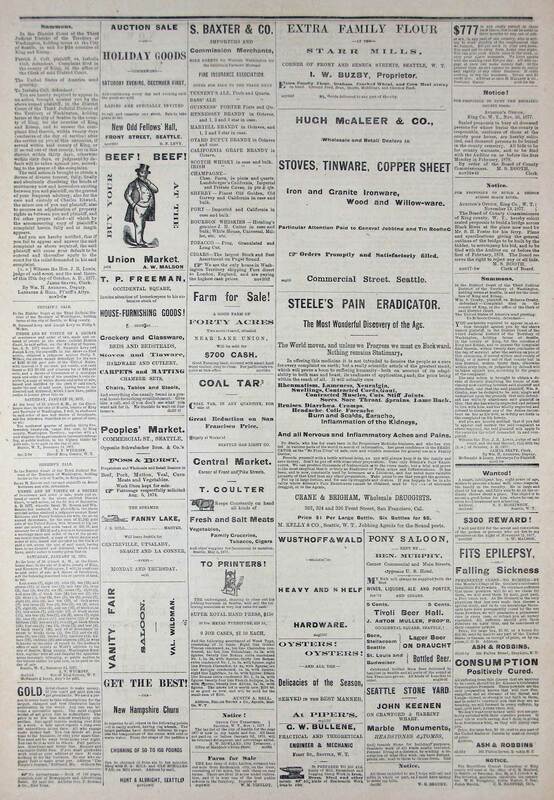 Page three shows a number of notices – e.g. T. Couter asks that “all persons are hereby requested to call and pay up, as I need the money to pay my bills by the First of January. ” It includes a complete – we assume – list of “Hotel Arrivals.” There are also more church announcements and one report of a street corner religious service with an assembly of doubtful believers. 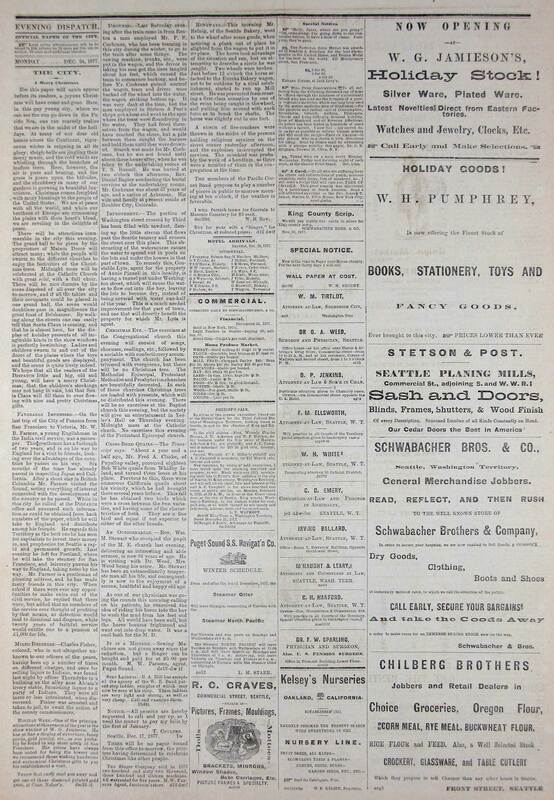 When the service was interrupted by a “bunch of fire-crackers” the paper concluded that this “mischief was probably the work of a hoodlum as there were a number of them in the congregation at the time.” And page three also shows more small advertisements, although not as many as page two. Page Four features more small ads – always enlightening of the times to read. The biggest among them is for Steel’s Pain Eradicator, which is described as “The Most Wonderful Discovery of the Age.” The jumbled lesson of this medicine is “The World moves, and unless we Progress we must go Backward. Nothing remains Stationary.” The producers claim no intention “to deceive the people” that their medicine is “a cure for every complaint on earth; but a really scientific article of the greatest merit, which will prove a boon to suffering humanity – both on account of its adaptability to both man and beast, [this part an appeal to farmers] its readiness of application, and the price being within the reach of all.” The list of “aches and pains” for which their solution is a great eradicator is wonderful – from “lameness” to gout and “soar throats.” (Persons who believe that such grandiose advertising is no longer possible are invited to listed to Seattle’s own KING FM through a few ad breaks.) For those Dispatch readers whose pains were not eradicated by this or any of the other promising solutions from bottled beer to Dr. Goulard’s “celebrated foot powders,” another ad on page four for John Keenen’s Seattle Stone Yard offers headstones and tombs.